Avid readers may recall my somewhat controversial review for Hunt For The Ring, where I talked about the fine line deduction games walk between giving too much information and not enough information. The key in a game like that is to give people some information and leave it there. The fun dissipates as soon as someone knows either nothing or everything, because the element of risk and uncertainty goes away. 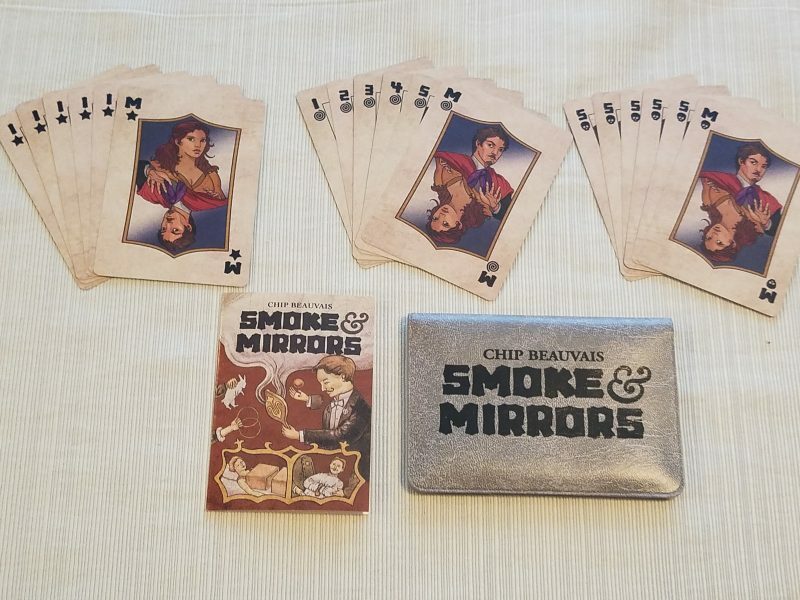 Smoke and Mirrors, a microgame (or “wallet game”) from Button Shy Games and Chip Beauvais, does a pretty decent job of doing just that. It takes the blind guessing from the satiristic game “Win, Lose, Banana” and gives just enough information to each player to make it interesting. 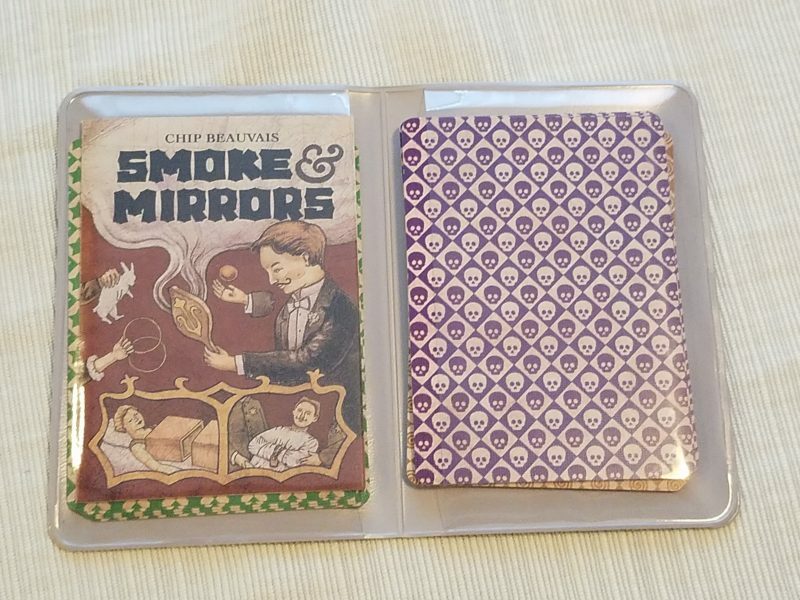 Smoke and Mirrors, like all of Button Shy’s games, is just 18 cards and fits into a bi-fold plastic wallet. The cards are divided into three decks–one has all 1’s, one has all 5’s, and the third contains numbers 1-5. Each deck also contains exactly one mirror card, which can duplicate the value of any other card it’s played with. At the start of the game each player is dealt one card from each deck. From this simple set of cards comes quick-playing bluffing game with a surprising amount of tension. Going around the table, players will lay down any number of cards from their hand, claiming to have played a number of increasingly ascending order. The first player must claim one, then the next player two, then three, and so on. Now, in any situation nearly anyone is going to have a one, because there’s a deck full of them. Being able to add up to two is fairly likely–a one and a mirror, or two ones, or a single two will all do it. Three is much more difficult, because the mirror cards probably won’t help (a hand of one, one, mirror being the lone exception). Fortunately there’s an out–each player can pass their turn once per round. At any point after someone makes a claim, the next person in turn order may challenge it as a lie. If they’re right, they eliminate the bluffer from the round. If they’re wrong, they get eliminated. The person who wins that challenge gets to take the cards of the eliminated player and discard back down to one card from each deck, giving them a better hand for the rest of the round. All of this is standard stuff, borrowed from some public domain/folk games I’ve seen before, but Beauvais makes some very smart decisions that hone in the design to something much better than what you can do with a deck of standard playing cards. There are more layers of decision-making here than you might think at first glance. For starters, each of the decks have a different back to them, so you get information simply by reading which decks someone’s playing from. This creates interesting mind games. If someone’s supposedly laying down cards that add up to 2, and they only lay down one card, do they actually have the one 2 card in the game, or merely bluffing it? The chances of having that card are fairly low, but if they needed to bluff wouldn’t they lay down two cards to make it seem like they have one of the more likely two card combinations? Then, of course, you have the knowledge of the cards you have in hand yourself, which can expose someone in a pinch. And, if you’ve previously won an encounter, you’ve been able to see more cards and more information, so you’re incentivized to take risks early. But as the game goes by you get more information about what people are implicitly claiming to have through the cards they lay down, so your accusations might be more informed later in the game. On an even deeper level you can track what people claim to have through their cards and use that information to more convincingly bluff when you need to by implicitly claiming cards you haven’t seen them claim themselves. And you can even gain information by seeing what claims others call out as bluffs–perhaps assuming that they have a card in hand that made the bluff fail. Every play in Smoke and Mirrors gives out some sort of information, if you look hard enough. It’s a game where you get out of it as much effort as you put in–if you take care to remember the claims and assumptions everyone makes you can create for yourself a tricky little puzzle. If you play more casually you can still have fun with some social deduction and guesswork. The downsides are what you’d expect–randomness with the cards and with seating position can give you more or less flexibility with what numbers you’re able to claim truthfully. Getting a string of bad luck genuinely feels frustrating, especially if it guides you towards more risky bluff-calling that doesn’t pay off. Getting a good combination of cards also tends to snowball into a win, because you’re more able to wait until you know a bluff is a bluff before calling one out, which gives you more card flexibility, which lets you be more selective again. There’s also not much of a theme here, which sets it apart from its closest popular competitor–Love Letter. Whereas that game has a charmingly convoluted story to try to make sense of its theme and cast of characters, Smoke and Mirrors ships with the thin veneer of something to do with a magic show, I think? Both games have guesswork and suspenseful card reveals, but I find that Love Letter creates a much more lighthearted, party-type atmosphere. There’s more laughter and ridiculousness and dumb twists of fate. Smoke and Mirrors tends to be relatively quieter. Honestly, a large part of that is because there’s simply more to think about. There’s more meat on the card game bones in Smoke and Mirrors. For that reason I prefer it a bit above Love Letter. Which game you prefer will probably depend on your preferences in this thought-to-laughter linear scale. But I couldn’t call this site The Thoughtful Gamer if I didn’t choose thought.